The name would appear to be derived from local Aboriginal word "gulum" or "kulum", meaning "blunt" or "headless", referring to the shape of Mount Coolum, which has no peak. According to Aboriginal legend, Ninderry knocked off Coolum's head and it fell into the ocean and is now Mudjimba Island. Mount Coolum is a volcanic plug, 681 feet in height, rising from the coastal plain and with part of its base projecting into the ocean to form Point Arkwright. 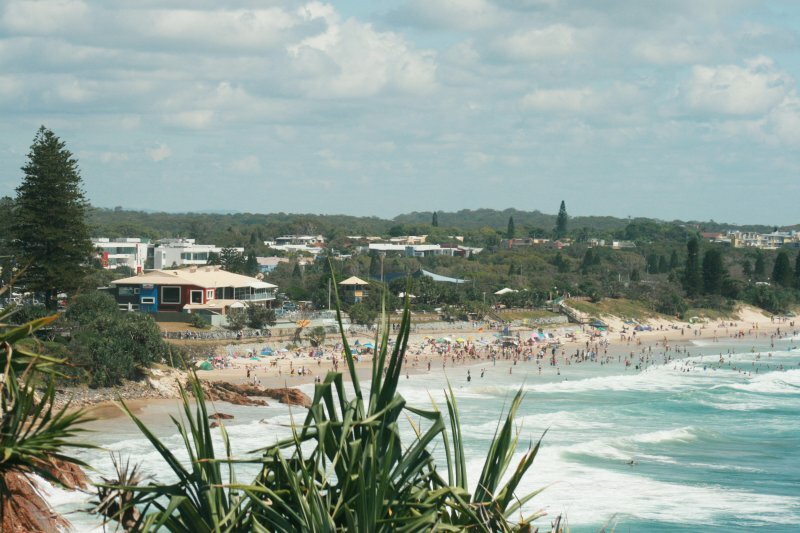 Coolum district was the traditional land of the 'Inabara' or 'Yinneburra' clan of the Undanbi tribe of Aboriginal people, which was in turn part of the larger group known as the Kabi Kabi (or Gubbi Gubbi). The clan diminished in numbers after the arrival of Europeans, and it is probable that the remaining members were moved to Aboriginal settlements such as Cherbourg during the early 1900s. The first Europeans to pass through Coolum were castaways in 1823, followed by shipwrecked sailors. Grainger Ward made the first land selection in Coolum in 1871 - a pastoral lease of 255 hectares, where he ran upwards of 300 head of cattle. In 1881, Mark Blasdall selected a pastoral lease of 252 hectares. He also planted the first sugarcane in Coolum, cut timber and built two huts and a sawmill as well as clearing Coolum Creek of obstacles to enable steamships to enter to load timber and deliver supplies. In 1882, steamships such as the "Tadorna Radjah" and 'Gneering" from Brisbane began to regularly travel as far as Coolum Creek and Dunethin Rock. In 1883, the first Coolum land was freeholded. In 1884, Blasdall was declared insolvent and his land freeholded. In 1905, William Perry-Keene obtained Portion 169 and moved to Coolum. Although others had lived in Coolum previously, Perry-Keene can legitimately be seen as the first permanent settler in so much as he moved his entire family and possessions to his property and was not an absentee landlord. His home which he called "Green Hills" was situated at the corner of Beach Road, Daytona and Key West Avenues. Between1906-1912, a number of people settled permanently in Coolum, and by 1912, there appears to have been about 8-10 families living in various parts of the district. In 1909, Coulson established the mailboat service on the Maroochy River, which provided the first regular connection between Coolum and the railhead at Yandina. In 1911, a horse-drawn tramline and punt loading facilities were built at Coolum Creek. The punt carried cane to the tram at Dunethin Rock for transport to Nambour. Access was a problem, but between 1922-1925 construction of the first genuinely trafficable road to Coolum was undertaken, providing vehicle access from Coolum to Yandina. In 1923, the tramline to Coolum was opened and unscheduled passenger services began. From 1923-1925, considerable expansion of the sugarcane industry took place in Coolum. With the extension of the tramline from the Maroochy River and the release of good cane-growing land, many new farms were taken up. Cane farming provided the main source of financial stability in the district until the advent of tourism in the 1960s.